In an unprecedented move, the Bar Council of India on Sunday suspended 126 lawyers of Tamil Nadu, including 21 Bar leaders who have been spearheading the ongoing Court boycott. This was pursuant to a resolution passed by the BCI, ostensibly in response to the call by the protesting lawyers to lay siege to the Madras High Court on Monday, protesting the recently amended rules to Advocates Act. The BCI will constitute a five-member panel to hold discussions with the State Bar Council and recognized Bar associations soon. As per a release from BCI Chairman Mr. Manan Kumar Mishra, those suspended include P. Thirumalairajan, Chief Coordinator of the JAC, and M. Velmurugan, former member of Bar Council of Tamil Nadu and Puducherry, Madras High Court Advocates Association Secretary Arivazhagan, Women Lawyers Association president Nalini and Egmore Bar Association president Chandan Bab. “These persons shall not be allowed to practice in any court or other forum and they shall not be treated as an advocate for any purpose. The council further resolves to initiate disciplinary proceedings against these lawyers for the aforementioned misconduct and the proceedings will be held in different places,” a BCI release reportedly stated. “It is because of these lawyers that the works of the court and the clients are held up and paralyzed for last two months,” it further said. Mr. Mishra said the number of suspended lawyers could go up as charges against 84 more lawyers were being verified. “The Supreme Court recently criticized us saying the BCI does not take action against erring lawyers and some other regulatory mechanism should be devised. Therefore, we have to act. We cannot shut our eyes to such issues. Suspension of the lawyers does not mean that BCI has accepted the rules framed by the Madras High Court (to deal with errant lawyers),” he added. 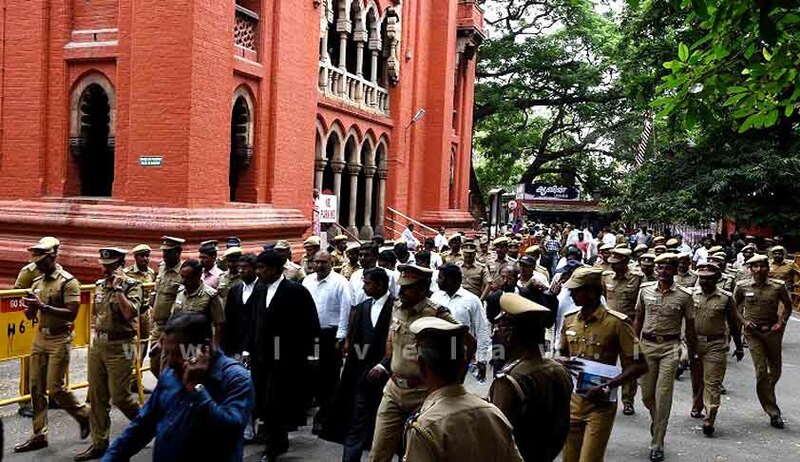 Despite the suspensions, protesting lawyers gathered near the Madras High Court on Monday. They were however outnumbered by the police, shortly after they began sloganeering. Several District and Subordinate Courts have been witnessing boycotts and strikes against the Madras High Court’s new sets of disciplinary rules for the Advocates The new rules enable the Court to debar lawyers who indulge in objectionable behavior. In a notification published on 20th May 2016, new Rules 14A, 14B, 14C and 14D have been added to the existing Rules under Advocates Act. The BCI had however issued a warning to the leaders and office bearers of more than 250 lawyers’ associations in Tamil Nadu, that they would be suspended and debarred from contesting in Bar elections if they fail to call off the strike by July 22. This warning was given effect to by the unprecedented suspensions.